We will be closed Thanksgiving Day, Thursday, November 24 through Sunday, November 27. We will reopen Monday, November 28 at 9 am! If you plan on coming in on Wednesday, November 23 please call ahead as we may be closing early. I used eight 4-inch tart pans instead and baked them at the same temperature for about 15 minutes. In a medium bowl, whisk together the mascarpone and honey. Carefully fold in the whipped cream. Spread as little or as much as you wish on top of the baked tart. Preheat oven to 375. Prepare the pastry. In the bowl of a food processor fitted with a plastic blade, pulse together the flour, sugar and salt. Add the cold butter all at once. Pulse 40 – 50 times or until the flour is the size of tiny peas. Gradually, drizzle the ice water through the mouth of the food processor, while pulsing. Stop just when the pastry begins to hold together. Pour out onto a lightly floured surface and form into a disk using your hands. Wrap with plastic wrap and refrigerate for at least 30 minutes. (Note: This can be done several days in advance and stored in the refrigerator until baking day, which, for me, will be Thanksgiving). Meanwhile, cut the pumpkin in half horizontally, and remove the pulp and the seeds using a stainless steel spoon. Discard the pulp and the seeds. Turn the pumpkin halves cut-sides down on a roasting sheet and cook in the pre-heated oven until the flesh is soft to the touch and beginning to implode, about 45 minutes. When the pumpkin is done, remove from the oven and cool at room temperature. Once the pastry has rested/chilled at least 30 minutes, roll it out on a lightly floured surface, to about 1/4″ thickness. Line the tart pan with the pastry, leaving enough pastry to create a slightly elevated pastry border, about 1/2″ higher than the edge of the tart pan. Line the pastry with crumpled parchment paper and fill it with pie weights or dried beans, gently pressing the beans into the bottom and edges of the paper so that they’re evenly distributed. Bake in preheated oven for 20 minutes. Remove the parchment and weights, brush down the bottom, sides and edges of the tart shell with the egg wash using a pastry brush. Return the tart pan to the oven and bake another 10 minutes or until golden. Remove from the oven and set aside. Reduce oven temperature to 350F. To prepare the filling, scoop two cups of the roasted pumpkin flesh out of the pumpkin halves and place in a large bowl. (Note – any left-overs can be stored in the freezer or refrigerator and later turned into a lovely savory soup or puree!) Using a hand-held mixer, blend together the pumpkin for 2 minutes on medium and blend into a smooth consistency. Add the eggs and light brown sugar, and blend together on medium for another minute, or until fully incorporated. Add the remaining ingredients and blend to combine on medium until fluffy, aerated, and fully incorporated. 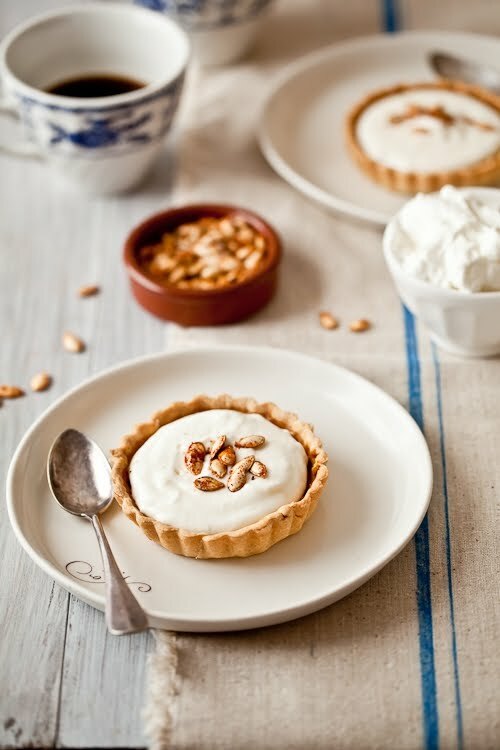 Gently ladle or pour the custard into the prepared tart shell, leaving a 1/4″-deep tart border. Place on a baking sheet and bake on the center rack of the oven. After 15 minutes, reduce the heat to 325F and continue baking until the custard has just set and quivers slightly to the touch, about 45 minutes total. Cool completely before slicing, or refrigerate for several hours or overnight before serving. Bring on the whipped cream! view the full recipe and pictures here. 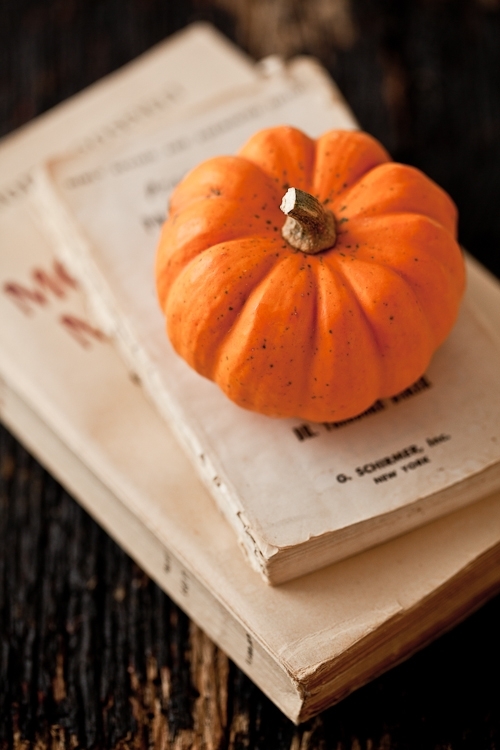 lovely notepad » Recipe Roundup: Pumpkin!